Will you have pretty flowers in your garden? What you need to get outside & clear up snows. Outdoors it's not only flowers - its leaf colour, berries, bark, and fragrance too - so if your garden is under the weather you should still find something to be cheerful about here. First, let me highlight a few essentials that will at least help you get out and admire your garden in the cold. Natural materials are still the best for warmth, while modern fabrics help with the wind and wet. You needn't even notice the cold. Take a look here to find a good winter jacket, gloves and fur-lined boots that will really help you enjoy the weather. Because I see many gardens that are worth getting out to view. Out and around your home and garden, you may be faced with clear-up jobs. Although I don't like clearing snow when 'black-ice' may follow, snow can become slippy when compacted. So this link to snow blowers, and shovels should help. You'll also find anti-slip matting and other winter accessories to help you on the roads. Now at least we can get out into the garden! - and I know that many of you won't even see a snowflake. So let me show you how your winter flowers could really put your garden at its best. Crocus, Snow Drop, Winter Aconite, Hyacinth, & Narcissus are here. For the most handsome winter garden you should probably include a basic structure of evergreens see below. In November a carpet of flowers will transform your garden landscape. From lawns to shrubberies, tree bases to the front of resting flower beds - most of the year they are hidden beneath ground, now they burst into life. You can have carpets of Crocus flowers from October to April. The early bulbs need to be planted in August while the late winter flowering bulbs should be planted by late autumn in time to establish good roots. Flowering carpets can include Colchicum (Autumn Crocus), plus Autumn, Winter, and Spring flowering varieties of Crocus. Dec to Feb - Crocus imperati - find Crocus for your garden here. You can also brighten your winter garden with Winter Pansies, Primula Flowers, Violas, Winter Aconite Eranthus, Snowdrops Galanthus and Anemonies. 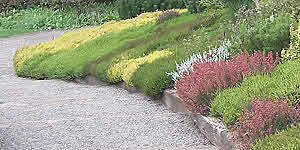 Let them naturalise under trees and shrubs. Primulas and Violas can be either reared in summer or bought in, and planted in autumn for outstanding winter color. Dead heading makes them last even longer. See more on containers below. Find plants for Fall planting - Winter Pansies & Viola x wittrockiana plus Primroses and Winter container plants here. More individually impressive herbacious plants of the season include Christmas Rose, Helleborus niger which blooms from early winter to early spring. And Helleborus feotidus has large clusters of flowers from midwinter to midspring. Lenten Rose flowers in early spring. Their finger like leaves combine well with the spikey divided leaves of the evergreen ferns such as Polystichum munitum or the Christmas Fern Polystichum acrostichoides. The above enjoy a shady spot. Pulmonaria rubra is another shade lover flowering from midwinter to peak in May. Find them all here. Another lovely January to February flower grown in drifts is Iris reticulata and Iris Danfordiae. Dwarf Iris are low growing flowers and ideal for rock gardens, gravel, wall pockets and the tops of banks. Choice varieties 'Katherine Hodgkin', 'Harmony', 'Joyce' and 'Purple Gem' or try a mixed grouping. Plant Dwarf Iris from late summer onwards - You'll find them here. Winter Jasmine - pretty yellow flowers brighten doorways in winter. Winter flowering Camellia - you'll find varieties that flower from November. Clematis cirrhosa - var purpurescens 'freckles' - amazingly early flowering clematis adds colour to your winter garden. Frost hardy but needs protection. Cut back to healthy buds immediately after flowering. Winter Sweet - Chimonanthes praecox - has lovely scented winter blooms. Witch Hazel - Hamamelis x intermedia - autumn leaf color - flowers Dec/Feb. Firethorn - Pyracantha - a reliable and stunningly attractive display of attractive red, orange or yellow berries. Around windows the thorns deter intruders. Corkscrew Hazel - Corylus avellana 'Contorta' for autumn leaves, twisted stems, can be cut for display and winter flowers. Contoneaster - horizontalis is one of several species with red winter berries. Variagated forms are available too. Holly - Ilex - flowers in April but is the most iconic plant at christmas time for it's berries. Many hollies need both a male and female varieites for berries to grow. But to 'J C Van Tol' is self fertile. Evergreen variegated hollies are very attractive. Why not grow holly to make your own christmas wreaths? Red Winter Berry - another Ilex shrub with stunningly attractive winter berries. Berries are a life-saver for hungry wild birds. Snowberry - Symphoricarpos albus - has white or pink berries in late autumn and winter. Spreads by suckers - I grow it containerized. And you might also look for Viburnum for flowers, Garrya for spectacular catkins and Cornus for outstanding stems. Find Flowers in Winter on Climbers and Shrubs here. Sweet Box - Sarcococca has become a popular plant for adding winter flower fragrance. There are several varieties that grow to different sizes. Plant it around your patio, windows and doorways to enjoy the scent. Don't forget the beautiful and majestic Mahonia x media 'Winter Sun' or a similar variety... Check out Mahonia the flowers are scented. 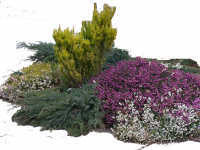 Heathers are an excellent evergreen ground cover that give you gorgeous color changes. Erica carnea foliage shades from green, to bronze and deep yellow. And December to May is the main flowering period for many Erica varieties: - see Erica × darleyensis 'Furzey', and Winter Heath Erica carnea 'Myretoun Ruby' and the lovely Erica carnea 'Rosalie'. Photo from early autumn. Many of the heathers will have red, purple and white flowers from around Christmas. You can choose Golden varieties of both large and small sized Conifers. They range in shape from tight pyramid or dome shapes, dropping or upturned branches to spreading ground cover. They add to the romance of a winter garden scene. Among other evergreens they give you contrasting highlights. Find more plants on this link. Tough leaves with yellow and cream variegation will brighten your garden. They really stand out during the darker days. And frost hardy varieties of Ivy with large and variegated leaves make an impressive winter garden scene. The late scented flowers, if short-lived, are lovely in a bowl. Leave them in the garden to attract bees and hoverflies. Variegated shrubs like Skimmia japonica have fragrant winter flowers and bright red berries from the year before. 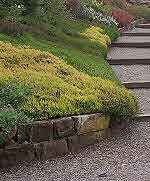 Others like green and gold Euonymus give contrast and cheer to the ground layer. Find more plants on this link. Many of the smaller flowers mentioned above grow well in containers outside. And in winter they probably won't need watering. You can even bring outside containers and hanging baskets of winter hardy flowers that have been more fully developed in some warmth of a polytunnel, greenhouse or conservatory. U.K. & European - Do you need help to clear your garden of winter snow and ice? The AA Emergency Shovel can be found on this link plus larger snow shovels from a reliable supplier. Find Ice Breaker Winter Grit & Spreaders on this link. Take care not to put it on your plants. But keep visitors to your home steady and safe. and be safe when you venture out to see the pretty winter scene. Find Winter Flowers, Garden Decorations and warm winter clothes further below vvv. Do you need help to clear your garden of winter snow and ice? 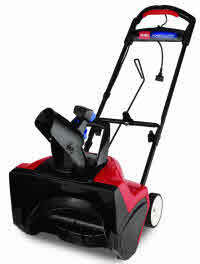 Here are snow shovels and a range of Snow Blowers from a reliable supplier. Look out for 'Keep It Green' and find how to Melt Snow & Ice with Grit Spreaders on this link. Take care with your plants. But keep visitors to your home steady and safe. Find Warm Winter Clothes further below vvv. U.K. & Europe - find your selection of plants for a winter garden on this link. U.K. & Europe - find your selection of plants for a winter flower garden on this link. American gardeners - click here for your winter flowers selection. American Gardeners - find your winter garden selection on this link. Crocus corms are here too. We never take the British weather seriously - you've only got to look at the number of synthetic fibre garments to know. So after some searching I found these Down Filled coats. You can really enjoy winter when you're warm. What about travelling around? Check here to get a grip... and be safe when you venture out to see the pretty winter scene. and for feminine style and warmth Canada Goose Women's Kensington Parka is here. there are more flower garden ideas on this link. U.K. & Europe - find top garden flower plants with more garden themes on this link. American gardeners click here for excellent value in flowers & plants. Tell us about your own flower garden ideas and garden plans? ^Don't miss out on a Winter Garden with flowers.